Timberline - where the trees end - is a biological boundary visible to even the casual traveler throughout North America. Where highways or hiking trails ascend to upper timberlines (ranging from below 2000-foot elevations in Alaska to over 11,000 feet in California), visitors see patchy forest and meadows giving way to stunted trees and finally to mere shrub-like trees and tundra. A lower timberline is seen in the semi-arid west at the foot of mountain ranges. Those who fly over northern Canada or Alaska see a cold-produced "arctic timberline" snaking across the continent. 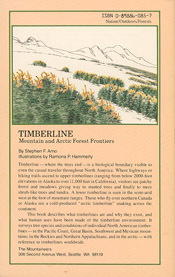 This book describes what timberlines are and why they exist, and what human uses have been made of the timberline environment. 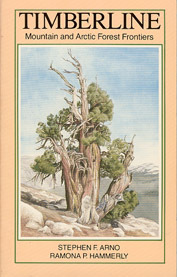 It surveys tree species and conditions of individual North American timberlines - in the Pacific Coast, Great Basin, Southwest and Mexican mountains; in the Rockies and Northern Appalachians, and in the arctic - with reference to timberlines worldwide.